Get those flavours all the way through the chicken by brining it before you roast it. Excellent yum factor here. The next best thing to having a genuine Tandoori oven - spit roast your Tandoori chicken. This rotisserie chicken recipe shows you how. For those who still have intact taste buds, try these subtle citrus flavours in this rotisserie chicken recipe. How to secure a rotisserie chicken to the spit. Tips for rotisserie chicken on an outdoor BBQ. 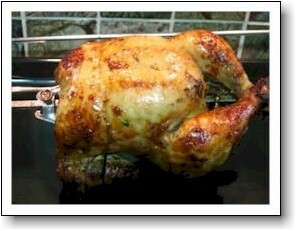 Rotisserie chicken also known as spit roast chicken is a real treat and not as difficult to do as one would imagine. These rotisserie chicken recipes will show you how. The advantage of rotisserie roasting is that the whole of the outside of the chicken get exposed to the heat and it gets roasted all over giving it wonderful colour and taste. Spit roasting can be done in a domestic oven or as part of an outdoor barbecue or braai. Smaller chickens are best for spit roasting, around 1kg - 1.5kg (2 - 3 pound) in weight. You can always roast more than one chicken at a time as long as the spit is big enough to hold them. Bigger chickens can be halved and secured to the spit by first piercing it through the thigh and then the breast. The chicken can first be brined or marinated (see the individual rotisserie chicken recipes), but simply basting it during the roasting process also works very well. The chicken needs to be secured to the spit especially if the chicken has been halved. Secure the wings of the chicken so that they do not hang loose and over-cook by tying them over the breast of the chicken. The wings can also be secured with a skewer or by using a trussing needle and some kitchen twine. Fold the neck skin onto the back of the chicken and secure it with a toothpick. If you do not stuff the chicken, a whole lemon pushed onto the spit and then positioned in the body cavity will secure and balance the chicken better. The lemon will add flavour to the chicken, but if you don't want the lemon flavour a potato will also work. Push the spit through the chicken from the tail end to the front. The spit will pierce the neck skin and the point of the spit should emerge between the branches of the wishbone. If you are using a lemon or a potato on the spit, position it inside the body cavity of the chicken. If you choose to stuff the chicken, spoon the stuffing into the body cavity and close the body cavity by using skewers or a trussing needle and kitchen twine. Make sure that the prongs of the spit are firmly in place. 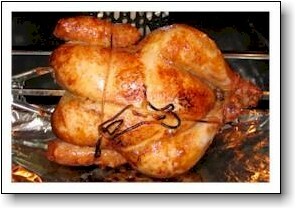 A roast that is very unbalanced, can damage the rotisserie mechanism. Due to the shape of a chicken, it can never be totally balanced on the spit, but do the best that you can. Finally attach the spit to the rest of the rotisserie mechanism. 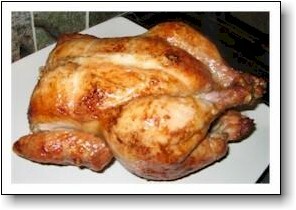 As with roast chicken, the rotisserie chicken can be both stuffed and basted. If you go for both options, make sure that the flavours compliment each other. It will take an hour to an hour and a half for small to medium sized chicken to roast on the rotisserie. Baste the chicken often during the last 20-30 minutes. The coals will no longer be glowing bright red, a layer of grey ash will cover the coals, but there will still be a visible red glow. Some parts will have thick white ash. You should be able to hold your hand 10cm (about 4 inches) above the fire for 4-5 seconds. Bear in mind that the height of the spit above the fire will also influence how much heat the chicken is exposed to. You will need to provide new coals as the roast progresses. For this you will need to keep a fire going alongside the roast or on a separate barbecue. The rotisserie chicken recipes provided here are suitable for an outdoor barbecue. After years of struggling with a dilapidated stove, we finally renovated our kitchen a few months ago and our new stove has a rotisserie. I had never cooked anything on a rotisserie in the oven before. My first attempt was a bit of a disaster as the chicken did not cook properly (my oven temperature was wrong), my herbs-and-butter-under-the-skin plan made the anaemic chicken look even worse and by the time I gave up and nuked it in the microwave, the kids were tired, hungry and grumpy and everything was just pear shaped. My second attempt at rotisserie roast chicken was a winner. I brined the chicken and my family just scoffed it down! Nothing like that to encourage one and ever since I have been very keen to try different recipes for rotisserie chicken. So here is my first successful rotisserie chicken recipe. Combine all the ingredients in a deep saucepan. Use a stainless steel or enamel coated saucepan. Bring to the boil and simmer covered for 10 minutes. Allow the brine to cool completely before use. Rinse the chicken and place it in a suitable container that will not react with the brine. (A plastic container is good.) Add the brine and ensure that the chicken is submerged in the brine. You might need to put a plate on top of the chicken to weigh it down. Leave the chicken submerged in the brine for 5 to 6 hours. Remove the chicken and discard the brine. Wash the chicken and dry it with kitchen toweling. The chicken is now ready to be roasted. Note: I had to fire-up my oven to hot for the rotisserie chicken to roast properly. Ovens are going to vary, as well as the position of the rotisserie in the oven, so treat your first attempt as a trail run to determine the best temperature setting for your particular oven. Baste the chicken with the olive oil and lemon mixture. Attach the rod with the chicken to the rest of the rotisserie mechanism. Roast for 1 - 1½ hours, basting the chicken with the olive oil and lemon juice ever so often. This Tandoori chicken is even better when roasted on the rotisserie. Lemon wedges for each person to squeeze over their chicken portions. Stir all the Tandoori Masala ingredients together in a large bowl. Skin the chicken and prick it all over with a fork. Put the chicken in the Tandoori Marinade and rub it all over the chicken with your hands. Cover the bowl and place it in the fridge to marinate for 4-6 hours, turning the chicken a few times to ensure that the flavour is spread evenly. Roast for 1 to 1½ hours. Serve with the fresh lemon wedges. Hot, spicy and flavoursome - you can't beat this Cajun rotisserie chicken recipe. Stir all the Cajun Marinade ingredients together in a large bowl. Put the chicken in the Cajun Marinade and rub it all over the chicken with your hands. Test to see that the chicken is cooked all the way through. To make the authentic version of this peri-peri chicken recipe you will need African bird's eye chillies or the dried powdered version of it. It is basically hot chilli marinated chicken that is grilled and the tiny African bird's-eye chillies are guaranteed to blow your socks off, so go slowly! This rotisserie chicken recipe explains how to get that authentic peri-peri chicken taste in a whole roasted chicken. The pili-pili version of the name comes from East Africa. When we were living in Tanzania I had a house-keeper and she was introduced to me as "Lita". It was only weeks later when I saw her name in writing that I realised, much to my embarrassment, that her name was actually "Rita". The subtleties of the East African pronunciation slipped by my foreign ears. Stir all the peri-peri marinade ingredients together in a large bowl. Put the chicken in the peri-peri marinade and using a pastry brush, spread the marinade all over the chicken. Also brush the inside of the body cavity with the marinade. Cover the bowl and place it in the fridge to marinate for 4-6 hours, turning the chicken a few times and brushing it with marinade to ensure that the flavour is spread evenly. The fresh flavour of orange always combines well with chicken. The rotisserie roasting process just seems to enhance the flavour and together with the golden crispy skin ... sublime! Stir all the Orange Marinade ingredients together in a large bowl. Put the chicken in the Orange Marinade and rub it all over the chicken with a pastry brush. Cover the bowl and place it in the fridge to marinate for 4-6 hours, turning the chicken a few times to ensure that the flavour is spread evenly. Brush the chicken with the marinade every time you turn it. Roast for 1 to 1½ hours. Baste the chicken throughout the roasting time ensuring that the final basting does cook through. Bring the remaining marinade to the boil in a small saucepan and simmer for a few minutes. Carve the chicken and serve with the remaining marinade.